"Certified Slabbed and Graded by PCGS as PR70 DCAM". "Second Coin In The Beatrix Potter Series". 2016 Royal Mint Beatrix Potter 150th Anniversary Peter Rabbit Colour 50p Fifty Pence Silver Proof Coin PCGS PR70 DCAM. Weight: 8.00 Grams / Diameter: 27.30mm. Issue Limit: 15,000 Worldwide. Presented: Certified Slabbed and Graded by PCGS as PR70 DCAM. In 2016 to commemorate the 150th Anniversary of the Birth of Beatrix Potter, the Royal Mint released a special Limited Issue Peter Rabbit 50p Fifty Pence Silver Proof Coin struck in solid. 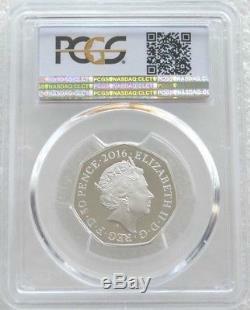 925 Sterling Silver and colourised by the Royal Mint Certified Slabbed and Graded by PCGS as PR70 DCAM. Beatrix Potter is world renowned for her 23 Little White Books for Children which include Peter Rabbit, Jemima Puddle-Duck, The Tale of Squirrel Nutkin, The Tale of Mr Tod, her small tales for small hands have endured for more than a century. The reverse design features Peter Rabbit in colour while the obverse features the Fifth Portrait of Her Majesty Queen Elizabeth II by Jody Clark. These legal tender coins have been struck to proof quality using specially prepared dies and highly polished blanks. Why is a Certified coin a better investment? PCGS & NGC are the main two impartial Numismatic Grading Services in the world and is a guarantee that the coin is genuine and has been graded accurately and professionally. The sonically sealed solid plastic slabb is individually numbered so that the details of the coin(s) can be verified on a central database, and is also tamperproof. 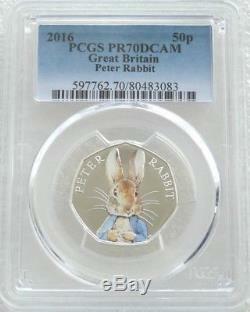 The item "2016 Peter Rabbit 50p Fifty Pence Silver Proof Coin PCGS PR70 DCAM POP 2" is in sale since Wednesday, August 30, 2017. This item is in the category "Coins\Coins\British\Proof Sets/Coins\2000s". The seller is "thelondoncoincompany" and is located in London.